As a Muslim and an Imam in the Baltimore area since 1989, I feel very sad to learn of the passing of this towering figure in interfaith and outreach. I still remember his visit to the Grand Mufti of Syria in my house next to Al Rahmah Mosque in 1990 when I was the Imam at the Islamic Society of Baltimore. We continued jointly in the path of building bridges until his retirement. It was he, who introduced my work in Washington, D.C. to the U.S. Department of State after being the Keynote Speaker at the Inauguration of my organization on September 30th, 2002. 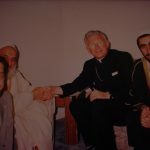 It was he, who gave me tremendous support in Baltimore to move forward with my mission of building stronger more cooperative Interfaith relations and it was he, who invited me to meet with Pope John Paul II during his visit to Baltimore. We will miss you Cardinal Keeler. Rest in peace! Even as your body departs us, your soul will continue to guide this city of ours and the State of Maryland, which was and will continue to be a beacon of tolerance, harmony, welcoming immigrants and coexistence among members of various religions, cultures and races.